When Audi introduced the TT facelift in July 2018, you might remember the Four Rings didn’t show the range-topping RS version of the coupe and roadster. Now, the five-cylinder duo is getting a similar nip and tuck with subtle changes that only an Audi aficionado will notice right away. The Ingolstadt-based marque says it has “completely redrawn” the front fascia, with perhaps the most obvious changes being larger air intakes on the front bumper to enable a more aggressive look. Hiding behind the honeycomb grille are extra radiators to enhance cooling, while the look of the full-width front spoiler is said to be derived from motorsport. You can have the spoiler’s blade in the same colour as the rest of the car or you can ask Audi to paint it in glossy black or aluminium. At the back, the fixed wing has gained new side winglets making the TT RS appear more masculine, and there’s a discreet strip extending from one taillight to the other. All TT RS models come as standard with LED headlights, but you can pay more and opt for matrix LED headlights and OLED taillights. Buyers get to pick from eight colours, including the Kyalami green shade exclusively offered on the TT RS. It joins the Pulse Orange and Turbo Blue colours new to the TT RS, and there are matte aluminium and glossy black visual packages to spice things up furthermore. 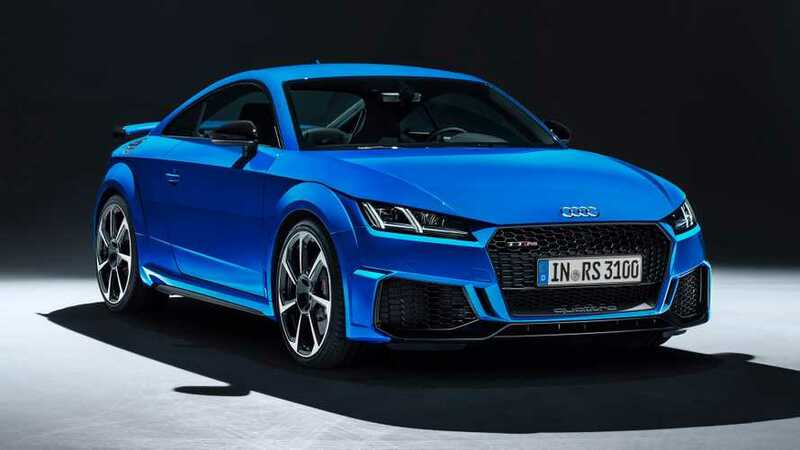 At the heart of the TT RS Coupe and Roadster continues to be the turbocharged five-cylinder petrol engine pushing out a healthy 395 bhp and 354 pound-feet of torque. 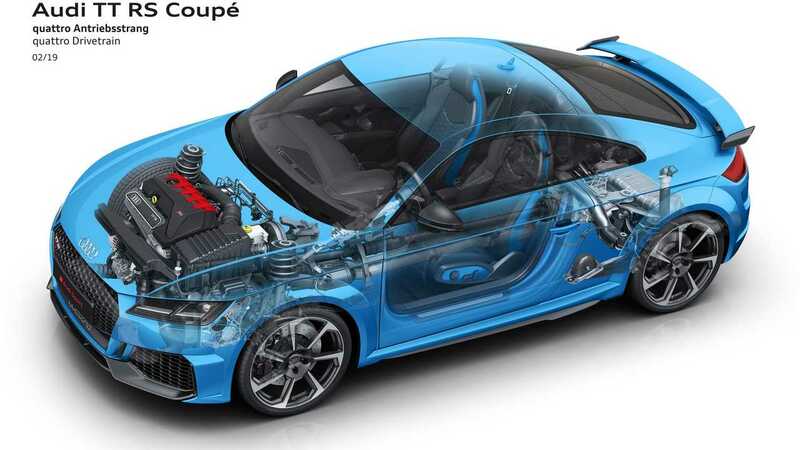 The International Engine of the Year for the ninth time in a row, the 2.5 TFSI enables the coupe to hit 62 mph in 3.7 seconds en route to an electronically governed 155 mph or an optional 174 mph. The Audi Sport muscle is channelled to the Quattro all-wheel-drive system through a seven-speed S tronic transmission sending all that power to the 19- or 20-inch wheels. The alloys are paired with black brake calipers as standard, but you can have them in red. At an additional cost, Audi will be more than happy to throw in the RS sport suspension with adaptive dampers to improve handling. Stepping inside, not much has changed. The infotainment’s software has been brought up to date and the system works together with the standard 12.3-inch digital instrument cluster. There are a few RS design packages with blue or red accents, along with sport seats finished with a rhombus pattern in Alcantara or you can have them covered in Nappa leather with a honeycomb pattern. Audi will begin to take orders in Europe tomorrow, February 7. At home in Germany, the TT RS Coupe is going to set you back €67,700, with the Roadster kicking off at €70,500. UK pricing to be announced at a later date.